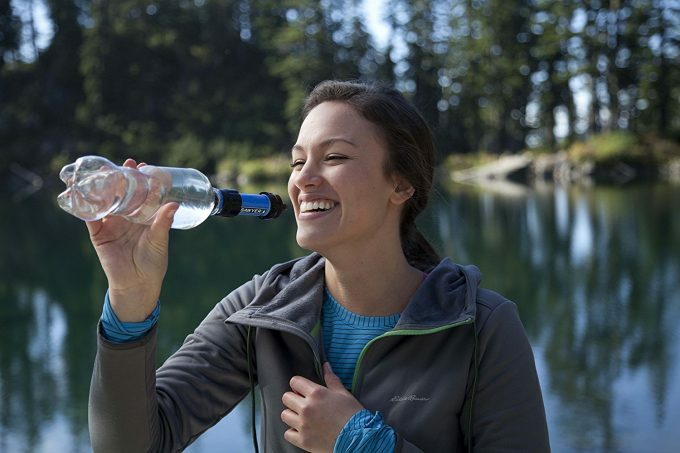 Have you ever found yourself in the middle of a hiking trip, realizing you’ve run out of drinking water? You will agree with us that having enough clean water is of highest importance when it comes to spending time in nature. 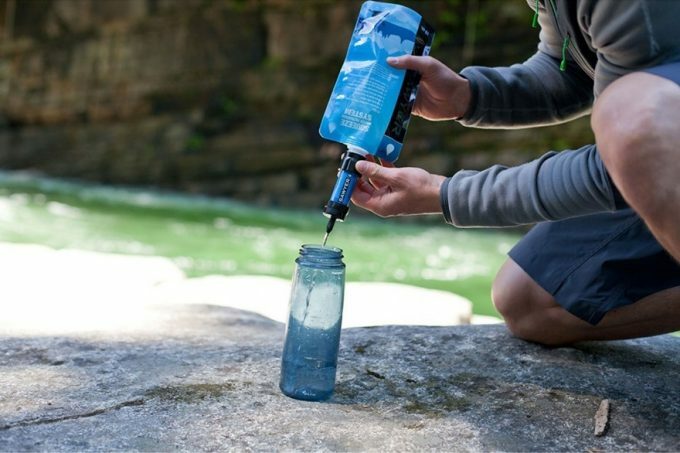 Since carrying bottles and bottles of water safe for drinking (especially) for longer trips is quite exhausting, and sometimes impossible, bringing with you the best backpacking water filter is the most practical solution to these problems. Drinking from rivers and springs can be dangerous, even when the water looks safe and clean – if there are microorganisms floating there, you won’t be able to see them. With a reliable water filter you can purify the water so it’s safe for drinking. It’ll save you a lot of additional weight on your back and you will never be tempted anymore to drink unexamined water and put yourself in potential danger. Every water filter isn’t the same and you should know what to look for in such product. 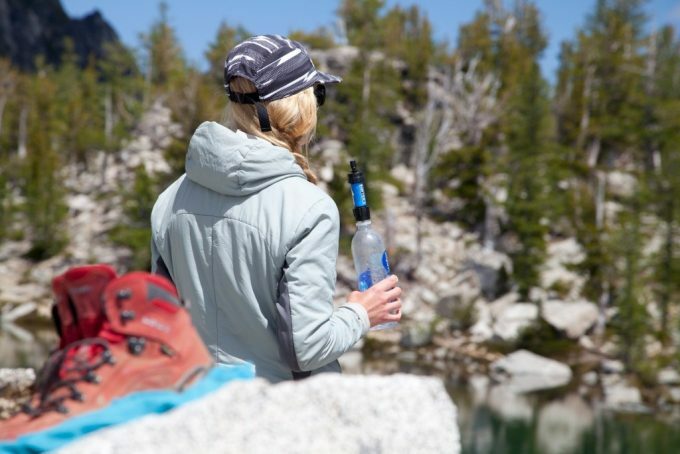 We’ve made a research and put together the most important features that you should consider when buying a backpacking water filter. 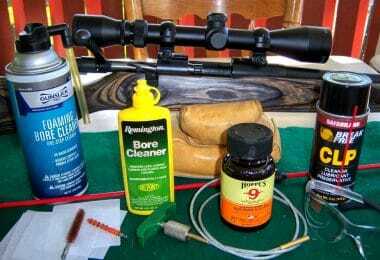 We also made a list and reviewed a small number of quality products you can rely on. Think about what you will be using the water filter for – are you going on a camping trip with all your family for five days? Or maybe you just want to have a backup plan in case of emergency? After you review your needs first, there are a few features you need to bear in mind to help you choose a great backpacking water filter. The performance of your water filter is the most important feature to consider before making up your mind. Check what exactly does your filter eliminate from contaminated water, what chemicals does it use, and how fast it filters water. Make sure that no matter which product you buy in the end, it meets the standards imposed by EPA and NSF. Some products are better than others in regards to dealing with certain types of microorganisms. Checking out the thickness of the filter membrane can be a good indicator of the performance of the filter – filters with a membrane of 0.1 or 0.2 microns are very good, as the density of the pores means most of the microorganisms will be removed. Apart from that, don’t forget to look whether it filters out certain bacteria and viruses. Some generic products that filter out the most common bacteria should be a good choice for the occasional hike; however, if you’re thinking about using the filter on international travels, you should get very specific. The performance part is also directly related to the speed of filtration. Check how fast the filter eliminates impurities. You’ll need faster filtration rates if you’re traveling in a group where more people will be using the water, or in cases when the time is of the essence. If you’re traveling alone most of the time, then even a filter with a slower rate of filtration should be enough. Portability is a feature of major importance in a water filter since you will need to carry it around on your back, sometimes for days. The best portable water filters don’t weigh much and have small dimensions. That makes them compact, easy to carry and convenient especially for longer hiking trips or international travel. However, smaller products may not always be suitable to be used by a larger group of people, such as families – some products don’t allow for more users while others can’t purify water fast enough. 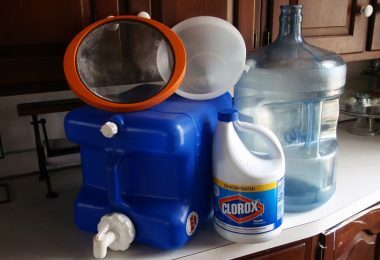 If you frequently do camping trips in groups, consider buying a larger purification system that can be used by more people at once. The materials used to manufacture the filter can be a great indicator of the quality and the performance of it. When buying, look for the membrane of the filter. Hollow or glass fiber membranes are resistant and usually able to filter out even the tiniest of impurities. Carbon is a good enough choice when it comes to the core of the filter, as it helps get rid of any chemicals, toxins, and it leaves you with taste-free and odor-free water. The outer case of the filter is important as well – look for cases that are sturdy and rugged. The filter should be able to stand out tough conditions without getting damaged easily. Having a multifunctional filtration system is always a good idea. Even if you were planning to use the filter only on camping trips, it could be great if your filter offers a more versatile use – for example, international travel or any urban emergency. However, don’t forget that versatility also entails how many people can use it and what for. Having a product that’s appropriate for a larger group is sometimes a better choice, as it should be able to store a certain amount of water as well. A water filter should serve its purpose for years. Don’t forget to check how many gallons of water your filter can purify and how you’d need to proceed after that – some water filters can be changed, while in other cases, you might need to buy a whole different filter. Some filters come with a limited lifetime warranty and it’s advisable to stop using it after it expires. Other manufacturers swear at the quality of their filters and offer free replacements in case the filter malfunctions. It’s our hope that by now, you’ve understood some of the basic features and learned a few things about those that matter to you the most. Let’s move on to the actual top ten product reviews on the market. After reviewing the most important characteristics to base your choice on, we’re compiled a list of products for you to choose from, along with descriptions. Here’s a review of what we think are the top ten top notch survival filters on the market. 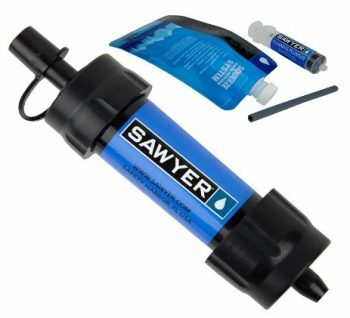 Description: Considering everything it offers, the Sawyer Mini Water Filtration System is definitely one of the best portable water filters – it almost flawlessly meets all the requirements we’ve discussed above, beginning with versatility. As such, you can use it for your standard hiking trips, for camping with your family (when you add a squeeze pouch), it is a great choice for lightweight backpacking, but also a great piece of equipment to add to your emergency kit. Since it weighs very little and it has small dimensions, the filter shouldn’t become a bothersome load to your luggage. Although it’s rather small, it still does the work: it has a filter made from a thin hollow fiber membrane of just 0.1 microns that works for purifying up to 100,000 gallons of water. You can use the 7 inches included straw and drink from a glass or bottle, or even directly from a pond, making sure that more than 99.999% of all bacteria and protozoa are eliminated. Additionally, you’ll also find a squeeze pouch you can reuse and a cleaning plunger included alongside the filter. 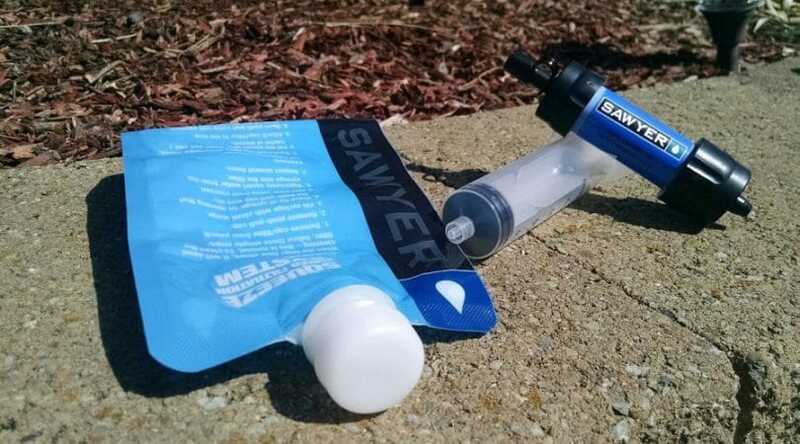 Related: If you’re looking for a fast and convenient way to fill your backpack hydration pack, then theSawyer Fast Fill Adapters should be your way to go. They’re light enough to be carried around but at the same time, they allow you to refill any hydration pack without needing to remove it from your backpack first. 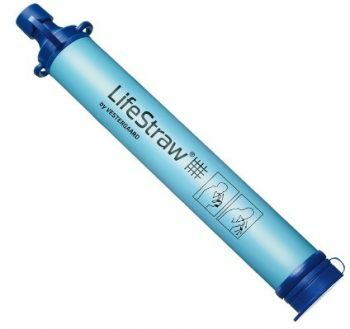 Description: The LifeStraw Personal Water Filter is so versatile in its use, that it can be considered as one of the best camping water filters in its category. 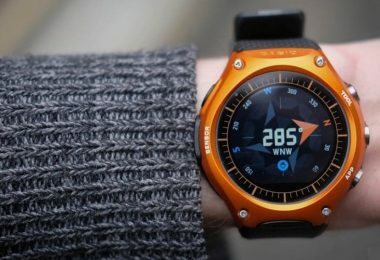 You could use it basically for any outdoor trip, like hiking, camping, fishing, or hunting, on international travels as well as for urban emergencies. This particular product was designed to help with emergencies and assist the victims of natural disasters, so you can definitely trust its performance. It’s one of the cheapest ways to purify water and get rid of 99.9999% of the bacteria that live in the water, without compromising on the overall quality of the product. Since it doesn’t use any chemicals, you can make sure it’s safe both for you and for the environment. The product can filter up to 265 gallons of water, and for some users that can mean years of clean water without needing to change filters or bother buying new products. However, probably one negative aspect about it is that it’s a straw – it might not be the best choice for larger groups. Related: The SurvivalSPARK Fire Starter should be a part of any survival kit. The magnesium fire starter should give you around 15,000 sparks while at the same time being extremely light and compact. On top of that, it includes a whistle and a compass, enabling you to get three products in one. Description: The Platypus GravityWorks 4.0L Filter System is a more advanced model of a water filter –apart from being able to purify water, this product also has the option of storing water for later use as well. However, some may find the system to be slightly complicated, as it consists of two pouches, interconnected through a sort of tube that has the filter attached to it. 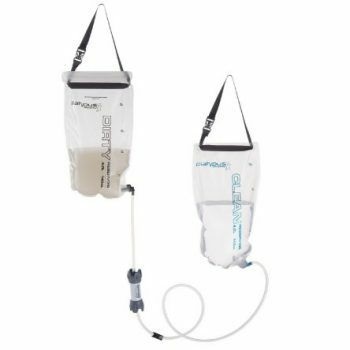 You’ll need to hang the contaminated water pouch and let gravity do its job. The filter allows you to filter around a gallon of water per 2.5 minutes. But on the other side, the filter can be backflushed very fast, in a matter of seconds – you won’t have to use any other tools to do that. It doesn’t have a lot of parts you can misplace or which can become damaged, so it’s good to go in no time. A great addition here is the zipper on the clean-water pouch that allows for easy access to drinking water. Since this item meets the EPA and NSF requirements regarding the elimination of bacteria and protozoa, you can make sure there’ll be no trace of Giardia, E. coli, Salmonella Cryptosporidium, or Cholera in your water. Related: The Platypus Carbon Element uses the force of gravity to remove any odor or taste from your water. Since it comes with a push-and-pull adaptor, it can be easily used with any other GravityWorks system to additionally filter water into your bottle or pouch – you just need to attach it in line with your Platypus system and let it do its job. Description: The Katadyn Vario Water Filter is definitely a great choice when it comes to water purifying filters – it’s made of high-quality materials and excellent craftsmanship. The first thing you can notice is that it has two pumping modes: you can either use only the glass fiber filter or add the ceramic pre-filter. The pre-filter is a nice feature to use when the water is particularly dirty, to make sure that the high volume of debris and particles don’t damage your filter. Both pleated glass and ceramic are good, sturdy materials and act as great purifying systems. You can easily choose between these two modes with a simple turn of a button. Since the replaceable core is made from carbon, you can be rest assured that there’ll be fewer chemicals and toxins in your water – it will stay fresh without having an unpleasant taste or smell. Another great perk about this product is that you can opt between two flow speeds: a fast and a slow one. The first will give you 2 quarts/ minute, while the second produces 1 quart of clean water per minute. The dual piston system used is also a nice addition to minimizing the effort and increase the amount of water filtrated. You could easily fill entire containers by attaching a hose to the adapter base, and use this item for your home needs. Related: If you need to change the carbon core on your filter, then the Vario Replacement Carbon should be the way to go. Apart from being light and convenient to store in your survival kit, the product comes with a decent enough price that should allow you to get up to 50-70 gallons of clean water. 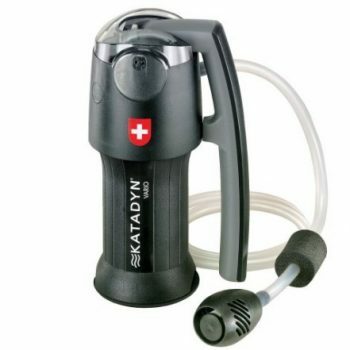 Description: The Katadyn Hiker Pro Microfilter is another great purifier that gets you rid of bacteria and protozoa, according to the EPA rules and requirements. The materials used for its manufacturing are quite top-shelf. As such, the filter is made from 0.2 microns glass fiber, which is a good filtering material for efficient purifying. The core is made from activated carbon that effectively deals with chemicals and provides a good taste to your water. The protector screen used for the filter can easily be cleaned even on the spot so that you can increase the lifespan of this cartridge. As a plus, it also filters out microscopic cysts and algae you might come across at in nature. If there are any dangerous chemicals in the water you drink, this water filtering product should do a decent job in removing those too, while keeping your water taste good. It comes with a bottle, an adapter, a pre-filter and a bag. 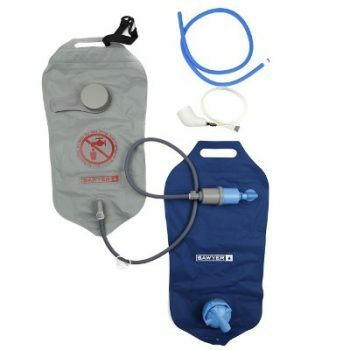 All of the components are easy to use and make up for an efficient system, which can be attached to other hydration systems, like hydration bladders. Basically, the product allows you to easily collect clean water and save it for later. 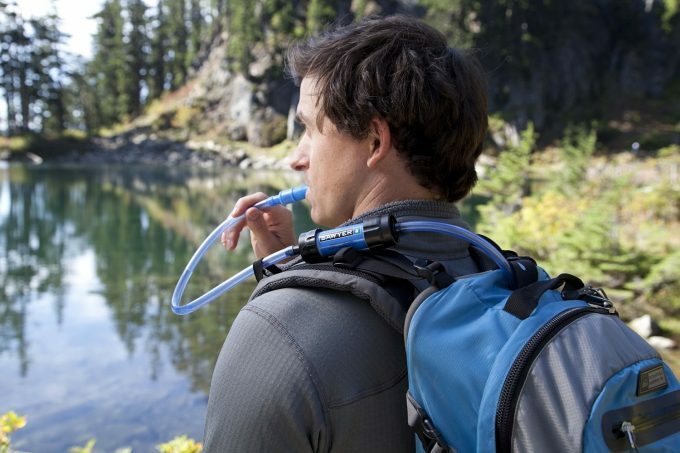 Since the product features quick connects, you can even pack a few hoses and get more water for your entire group, should you decide to go on a longer hiking trip. 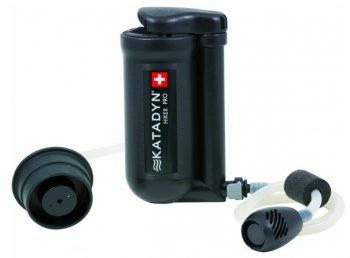 Related: The Katadyn Quickfill Adaptor can prove to be a great addition to your water filtration system. It allows for an easy connect and it should fit any water filter with an output hose. The adaptor should also give you the option to fill hydration bladders without opening up your pack. 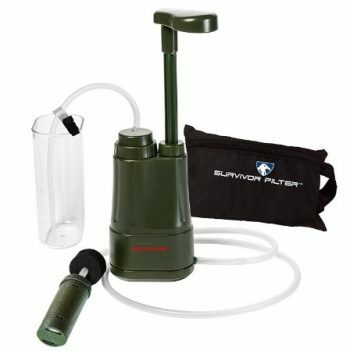 Description: The Survivor Filter PRO-LE Water Purifier is a great water filter to take along on your hiking trip – it’s light, small, and easy to carry. Lab tests show some really great performance – getting rid of 99.9% of bacteria and viruses and reducing dangerous chemicals like mercury (99.5%) and lead (93%). The filter should have a very fast filtering rate of about 17 oz. of water per minute. The large tubing definitely aids the fast flow rate. Another great thing about the product are the additional accessories that come with it: you’ll also get a pre-filter, a hose clip, a zippered case and an attachable cup to store and drink water more easily. The product allows you to drink water in three ways: drinking from the source, from the included cup or store the water and drink it later. With this item, you should be able to purify up to 26,000 gallons of water. If you’re by any chance unhappy with its performance, you could just use the money-back guarantee offered by the manufacturer. Related: If you’re looking for an upgrade to your survival kit, then check out the BlizeTec Survival Knife – it’s a 5-in-1 product that any survivalist should have! Apart from the folding blade of the knife, it features a LED flashlight, a magnesium fire started, a seatbelt cutter and it can be used as a glass breaker – everything you might ever need in a case of emergency! 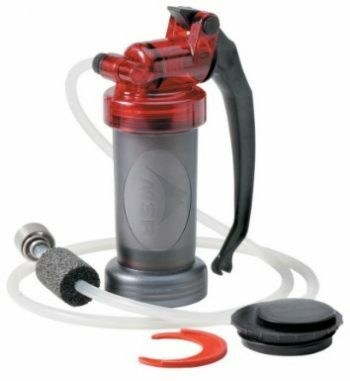 Description: The MSR MiniWorks EX Microfilter is made from tough materials that are very appropriate for intensive use. Both carbon and ceramic materials were used, offering a plus of durability and safety. The product meets NSF protocol P231, removing 99.9999% of bacteria and 99.9% of protozoa, from the beginning to the end of its filter life in “worst-case” water. The carbon core should be almost perfect for eliminating dangerous chemicals that are sometimes found in water, ensuring safe, taste-free water even with frequent, heavy use. When traveling abroad, you don’t have to fear that you can only drink water previously treated with iodine or chlorine. The fact that this filter is well designed can be noticed by looking at its filtration speed too. Since it can purify 1 liter of water per minute, it means that the built-in AirSpring Accumulator does a wonderful job. You can confidingly take it with you when you’re hiking with a larger group. The whole thing is easy to clean as many times as you want, without using any tools, in order to keep it up and running at top levels. Related: If you’re looking for a water bottle for your next backpacking trip, then the Nalgene Tritan Water Bottle may be just the right thing for you! The bottle itself is BPA-free and it’s made from the finest materials. It has a 32 oz. storing capacity and it features a wide mouth opening. 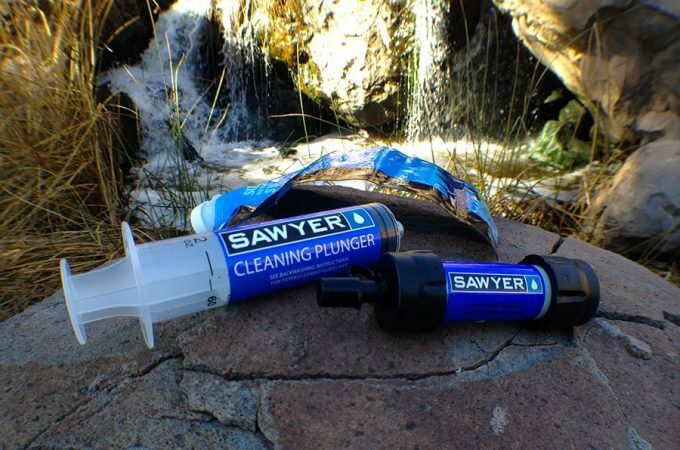 Description: The Sawyer 0.1 Micron Water Filtration System is a two-bag water filter that uses gravity to its own advantage to purify water at a very fast pace. As such, it can deal with 2 liters of contaminated water in less than 1.5 minutes, without leaving behind any residues or an unpleasant taste. This is convenient for longer trips when you want to filter and store more water, as well as for larger groups. Since this item comes with two reservoirs each with a capacity of 2 liters, you can easily put aside 4 liters of water for later use, which makes this product one a great backpacking water filter. The filter is manufactured from a hollow fiber membrane that’s 0.1 microns thick. That translates into a very dense fabric that removes 99.99999% of all bacteria, such as salmonella, cholera, and E.coli and 99.9999% of all protozoa, such as giardia and cryptosporidium. The ABS plastic from which the housing is made is another sturdy material that withstands repeated use, ensuring a long lifespan. You can easily clean it at the camping site or even hang it on a tree branch to clean your own dirty dishes if you’ve stored enough drinking water. 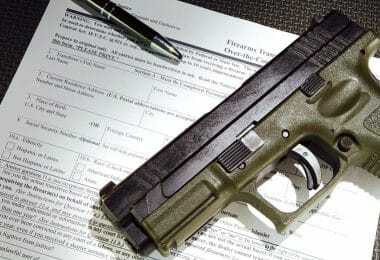 The lifetime warranty is a definite plus. Related: The Frontiersman Bear Safe Food Container might be just the thing you need for your next backpacking trip – it’ll allow you to keep bears away! The bear canister is lightweight and has a very easy opening and closing mechanism. The container has a maximum storing capacity of four days, making it almost perfect for weekend getaway trips. 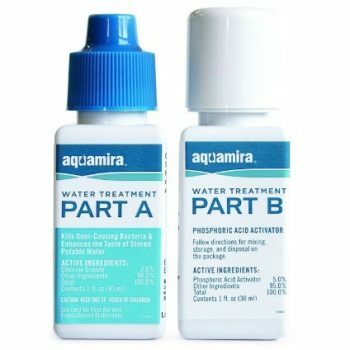 Description: The Aquamira Water Treatment Drops are a chemical purifier that consists of two 1-ounce bottles that should be used as instructed. The first one is liquid chlorine dioxide which kills many bacteria that cause an unpleasant smell. The second bottle is phosphoric acid activator that balances the water pH, giving it a normal aftertaste. Also, remember that chlorine dioxide isn’t the same substance as simple chlorine a.k.a. bleach – the chlorine dioxide doesn’t create harmful by-products. Given the small dimensions and weight of these two bottles, they’re perfect for abroad travel, making them the best choice of portable water filter for people who want to use a chemical means to get rid of waterborne pathogens. Besides, it’s a very convenient purifier that lasts for up to 4 years after it’s been opened, and these two small bottles can deal efficiently with 30 gallons of contaminated water. The only downside is that you’ll have to wait about 20 to 30 minutes for the filter to do its job, depending on the temperature. Note that this product only kills waterborne pathogens, but it doesn’t remove suspended solids. Use the drops to purify clean, transparent water. If the water is cloudy or muddy, the drops won’t clean out the sediment. The only way to get rid of it is to filter the water. Related: If you want to make your camping trips even better, then check out the Ultimate Camping Lantern – a light that features four different working modes and comes with a durable and waterproof case. The product is lightweight and includes a retractable hook, which is convenient both for carrying and for using the product. 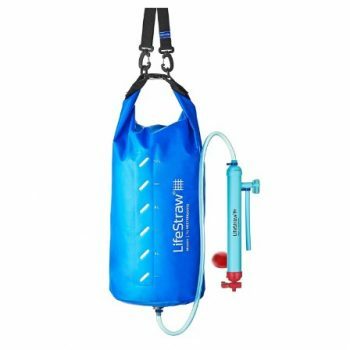 Description: The LifeStraw Mission Water Purification System is another great product when it comes to camping water filters, especially if you’re going away with a large group. This is another type of gravity-activated purifier that can work at a high capacity and with a decent flow rate reaching about 2.4-3.4 liters of water each hour. Since it’s made from a hollow membrane fiber that has 0.02-micron pores, only clean water will pass, with the filter trapping inside 99.9999% of bacteria, 99.99% of protozoa and 99.999% of viruses contaminating the water. Other dangerous chemicals and debris will be caught inside it too, and backwashing will flush them out. The total capacity of 4,755 gallons filtration for its whole lifetime is another advantage, which entails you’ll be able to use it for innumerable hiking trips. The product is very low maintenance and it doesn’t require additional equipment. It can be easily hung from a tree branch, you can drink directly from it, or you can store water for later use. On top of that, the pouch in which the contaminated water is collected has a wide mouth for fast filling. Related: If you’ve been thinking about upgrading your backpacking gear, then the SE All-Weather 2-IN-1 Fire Startermight be an excellent choice. The product includes a magnesium bar with a flint, and it’s small and light enough to be kept in a pocket. The manufacturer has also included a compass and a detachable ball chain. There it is – our small contribution to a topic so broad and wide! 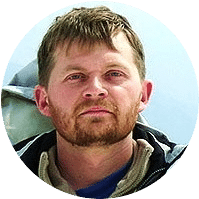 By shortly going through the most important aspects of choosing a backpacking water filter, and reviewing some real fine products out there, we hope we could be of help to you! So, have you already picked a product? Or do you maybe own one of these and would like to share your experience with us? Maybe you have in mind another product you think should have a place in our list? Drop us a comment and let us know – we can’t wait to read your reviews!